The analytics resource that works for you, when you want it, how you want it. We’re now offering a brand new way of working to our customers. Purchasing blocks of time (days and hours) is a thing of the past. With our new subscription model you have access to a data analytics expert as often as you like, want or need. 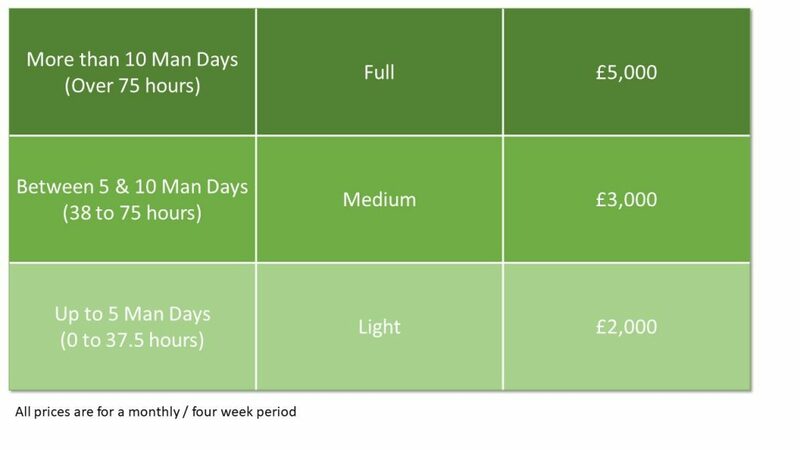 For just one simple fee you can benefit from up to 150 hours a month of data analytics expertise, that’s the same as a dedicated full time employee working on your analytics project. No need to hire new employees, buy specialist software or pay inflated contractor rates. If you don’t think you’ll need a full time worker one month, then scale back to part time, or even put your subscription plan on pause. We can restart it again whenever it suits. No minimum term – you can cancel at any time. Need to take a break – put your next month on pause. Hitting a busy period – make use of our flexible three tiered pricing. Our subscriptions run on a calendar month basis, or if you’re starting mid-month, for a total of four weeks. Towards the end of each month you can easily let us know your intentions for the following month and we will adjust your plan accordingly. For other tools, just ask. Subscription ‘live’ is when the subscription is fully operational and full data analytics support is to be provided. The standard charges (later) are applicable. Subscription ‘paused’ is when the subscription is non-operational but minor queries can be made in relation to work coming up or work previously completed during a ‘live’ phase of the subscription. The subscription status for a month or a 4 week period i.e. ‘live’ or ‘paused’ should be confirmed during the fourth week of the prior month or 4 week period. A ‘paused’ status can be lifted and switched to ‘live’ at any point. “We had a number of analytics that we wanted to implement and knew from previous experience that DataConsulting would be a good partner. We opted for the subscription model to allow continued focus on these projects whilst the audit team could continue to deliver the audit plan. This also allowed us to take advantage of DataConsulting’s ACL knowledge and support when updating to the latest version of AN and AX.